I took my two children to see the recent production of Puss in Boots at the Gate Arts Centre in Roath, Cardiff. I was pleasantly surprised how welcoming the venue was. Before the performance children were given paper and crayons to colour while the parents were sat looking rather relaxed. We had a quick drink before the show was about to start then were called to take our seats. I cannot believe I haven’t been inside this beautiful building before. For those who don’t know, The Gate is housed in a 100 year old Grade II listed building, beautifully kept and formally the Plasnewydd Presbyterian Church. The performance was led by four dynamic professional actors from Black Rat Productions. The characters were, Puss in Boots, Jack6, the Princess, and Slime (the giants slave). They gave the story a slightly different slant which was extremely funny, for example, in one scene Puss in Boots had a dance off with Slime. I found this rather amusing when they started trying to outdo each other with line dancing moves. 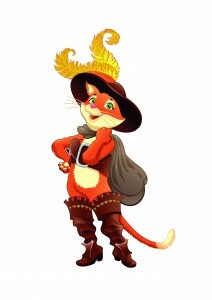 With the classic boo and hisses the original production brought this classic French feline tale of adventure to life. The poor man and the princess sang a few beautiful songs, one of which included a very popular song from the movie Frozen, and one of my favourites, `Happy` by Pharrell Williams. That really got everyone singing and the children out of their seats. The actors utilized all exits of the stage and hid near the audience during various parts of the performance. The children loved this and got very excited having them close by. During the finale a large giant came out on stilts, the costume was amazing. He then transmogrified into a mouse and the rest is history! After the show had finished the actors came back out to meet the children and were very willing to have their photographs taken. This is something I haven’t seen before. They were all so approachable and down to earth. The Gate is so welcoming and has such a family orientated atmosphere, we will definitely be back again soon.